The world is becoming an interesting place. Failed diplomacy and rising terrorist activity are but a few of the commonplace headlines around the world. "That kind of thing can’t happen in my back yard…that happens over there”, is a common thought amongst most North American business owners. Why is a Commercial Collection Agency Writing about This? In our opinion, commercial debt recovery firms are ripe for money laundering activity. A “client” places a large commercial claim against another entity. The “debtor” company then pays the amount owed and your “client” wants a wire transfer, of the funds collected, to an account outside of North America. If the commercial collection agency does any amount of international work, this kind of transaction occurs frequently. 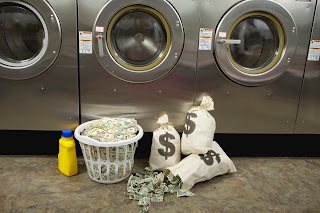 The fact is that if a firm transfers funds from one individual or organization to another using an electronic funds transfer network or any other method such as bitcoin, hawala, hundi, fei ch'ien, and chit, can be target candidates for money laundering or even terrorist related activities. What is Priority Credit Recovery Doing to Combat Suspicious Activity? Priority Credit Recovery Inc. (PCR) is a national commercial debt collection agency in Canada. PCR has recently adopted certain compliance regimes to help identify and report suspicious financial activity. PCR is in the process of becoming FINTRAC compliant. PCR is in the money service business; therefore we must develop comprehensive customer on-boarding procedures to ensure compliance. The Financial Transactions and Reports Analysis Centre of Canada (FINTRAC) is Canada's financial intelligence unit. Its mandate is to facilitate the detection, prevention and deterrence of money laundering and the financing of terrorist activities, while ensuring the protection of personal information under its control. PCR will collect data from the prospective foreign customer such as full name, full name of company, date of birth, copy of incorporation certificate, copy of passport, and similar other identification. If the proposed transaction meets the criteria to be considered suspicious; then we must report the activity to FINTRAC. Recently PCR implemented the CSAE 3415 Type II Audit. It is a report on Management’s description of the system and the suitability of the design and operating effectiveness of our business controls as it relates to our clients sensitive data and financial transactions. Compliance with CSAE 3416 and FINTRAC ensures that PCR is managed correctly and that checks and controls are in place to ensure the company remains strong. PCR controls millions of clients’ trust funds every year. The audit trail and controls ensure that clients’ trust funds, and their customers’ personal data, remain secure. In today's networked world there are tremendous technologies that credit and collection professionals can use to their advantage. If you don’t know how to Tweet, Link, Connect, Like, Share, Comment or Post; you will get left behind. Credit Managers, Business owners, and receivable staff should be encouraged to have a profile on LinkedIn at the very least. Care should be taken to use specific keywords when creating your personal or company profile. Let the world know what you are good at. Ask your customers and suppliers for references. Most importantly send your customers and prospects a Connection Request. If accepted, you can learn a lot more about your customer and them about you. Why is Social Media Important in Credit? In our popular article entitled “The 12 Danger Signs”, we outline several scenarios where a LinkedIn connection to your customer would prove invaluable. Would it be useful to know if several of your customer’s key management personnel left the company? What if your prospective customer gives you a credit application and states they have been in business for 10 years, yet the company profile (and that of its owner) is either sparse or non-existent? Should you be worried or at least pause a little bit? If your customer’s business is operating as a going concern, you should see some social media activity, some on-line advertising, an updated webpage, perhaps an on-line store or even a Kijiji advertisement. All of this activity should give you some level of comfort that your customer or prospect is trying to build their business. Conversely if you do a Google search and only find a website with your customer’s equipment for sale – then that would be a major cause for concern. Prior to extending credit or entering into a contract, we strongly encourage you to examine the social media of person or company with whom you are contemplating doing business. You can tell a lot about your prospective customer by checking their on-line profiles in LinkedIn, Twitter, Facebook, Instagram and Pintrest - just to name a few. Perform an internet search on your customers email address and cell number. You may be shocked/ pleased at what you find. Do your due diligence on a prospective customer well in advance of processing the first order.